On the planet Cray, it’s game time. The Gora and the Lineen are set to face off in the grudge match to end all grudge matches. The players are limbering up, the commentators are preparing, the fans are daubing themselves in their team’s colours. The arena is set, and the kick-off is approaching. When the Doctor and Nyssa arrive, however, they find that Naxy is a sport that anyone can play – whether they want to or not. Cray’s entire future depends on the match’s outcome, but the time travellers soon realise that it is anything but just a game. Peter Davison is the Doctor in The Game. Once upon a time, Doctor Who serials were often longer than an hour. Since 2005, episodes of Doctor Who have stuck to the standard hour long episode format…well, in America, it’s 44 minutes plus 16 minutes of commercials and bumpers…and in Britain, isn’t it 45 minutes of uninterrupted narrative and plot followed by a commercial or two, or the BBC continuity announcer, or another episode of Eastenders?…screw it, it’s an hour long episode for the purposes of this introduction. Since 2005, episodes of Doctor Who have stuck to the standard hour long episode format, with the obvious exceptions of episodes like the Christmas stories or the Year of David Tennant Specials. During the classic era, however, the length of each serial varied, both in terms of the number of episodes that made up each story as well as the run time of each episode. The Second Doctor’s final serial, The War Games, ran an astonishing TEN episodes of 25 minutes each, while Inferno, with Jon Pertwee, was made up of seven 25 minute episodes. The Sixth Doctor would see several of his stories run over two 45 minute episodes, and by the end of the classic run the Seventh Doctor would star in adventures composed of three 25 minute episodes. There are various reasons for the varying length and runtimes of stories, including budget concerns, expanding or contracting a story to fill a timeslot, limited availability of actors and crew, or just plain old executive meddling. Sometimes, a story with a long runtime would allow the writers to flesh out secondary characters and tell a story with all the necessary parts, but there was also the risk of filling any “empty” runtime with unnecessary subplots or scenes, such as the Doctor escaping at the beginning of an episode, only to be recaptured a few minutes later with no necessary plot advancement. A story with a short runtime goes by quickly as tells its story, but a rushed production could mean less-than-ideal takes get put into the final product, or a subplot is glossed over to the viewer’s confusion. For the most part, Big Finish has stuck to a general format. The stories of the main range stick to a four-episode layout, with episode runtimes that have varied from 21 minutes to 33 minutes. There have been a few exceptions, such as the two hour-long episodes that made up the finale of the Eighth Doctor’s second season, Neverland and the multi-episode mess that was Zagreus, as well as the Eighth Doctor Adventures and the Fourth Doctor Adventures being comprised of two “30” minute episodes for each story, to more closely match the pacing of the revival episodes to draw and hold the interest of new listeners to Big Finish. 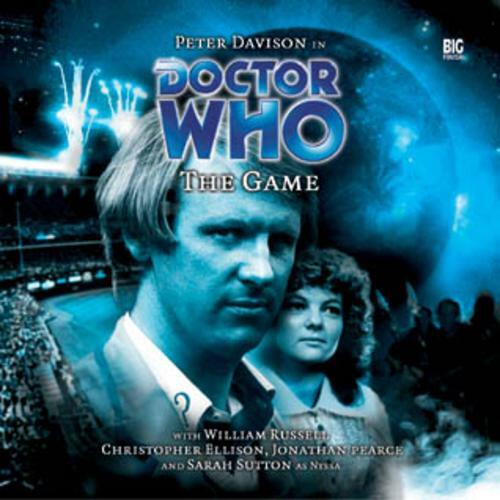 The Game plays out over six episodes, as the Doctor and Nyssa find themselves on a planet where civil war has been reduced to a violent game that encompasses every aspect of society. Over the first four episodes, the story is engaging enough, but it quickly takes a 90 degree turn to become a completely different story with an out-of-the-blue villain, throwing away the buildup from the first four episodes. Violence as entertainment is familiar ground for Doctor Who. The very idea of murder for sport or harm for pleasure is against the very nature of the Doctor. The concept conjures up thoughts of the Ninth Doctor stories The Long Game and Bad Wolf, or perhaps a classic tale of the Sixth Doctor, Vengeance on Varos. In the CD liner notes for The Game, writer Darin Henry states that it was his wish to try his hand at a six-episode audio adventure as a throwback to the days of the classic series. It’s a weird writing choice for him to make, as he writing credits are comprised largely of American sitcoms, including a few episodes (22 minutes in length) for Futurama and Seinfeld. With experience focused more on shorter, one-off episodes, it feels like Henry has bitten off more than he can chew by going with six episodes. As a whole, The Game clocks in at just under two hours, but in trying to expand the various plots over six episodes, Henry loses sight of exactly what type of story he’s trying to tell. Considering the popularity of football in the United Kingdom as well as football in the United States, the concept of a competitive sport, with fatal “retirements” and pre-game shows akin to Match of the Day or Sunday NFL Countdown is one that should resonate with listeners from the very beginning of the story. It’s the love and passion football fans have for the game and their clubs/teams (and by the way, go Steelers! Kings of the North! Beat Baltimore!) that makes Naxy ring familiar with listeners, especially the talk off the pitch/field of endorsements, salaries, and personal records. Henry bounces back and forth between the on-field action, the play-by-play, the behind the scenes training, and touching upon the rabid fanbase. If the story had been solely about the violence of Naxy and how the brutality has become commonplace, even celebrated, with no immediate end in sight, than The Game would have fit right in with the pacifistic tendencies of the Fifth Doctor. On the Naxy side of the ball, the acting is on the high side of passable. Andrew Lothian and Dickon Tolson play rival Naxy players, with Lothian playing superstar Hollis as the “jerk on field, decent fellow off of it” type and Tolson as the “on the losing end with one last chance to turn the season around” player-coach Sharz. Both do fine even though at times it’s tough to tell the two characters apart even when they’re on opposing sides of the pitch. Gregory Donaldson (long of the BBC series The Bill plays the desperate Lineen coach Destry who turns out to have a larger stake in Naxy than anyone knows. Well known BBC football announcer Jonathan Pearce plays the part of Naxy announcer Garny Diblick exactly as one expects, adding a sense of drama and urgency to the otherwise “gotta kill em all” Naxy proceedings. His death scene is a standout moment of dark humor as well. Where Henry goes a bit too far is by adding in the subplots regarding Lord Carlisle and the sudden emergence of intergalactic crime lord Morian, with both tying into the main plot in substantial ways. Just one of these subplots would have been a fine addition to the story. There could have been time for development of plot and characters as well as adding a suitable twist to the Naxy proceedings. But instead, the more interesting subplot of the two gets completely overshadow by the “out of nowhere” nature of the other. While hints of a shadow broadcast are evident from the very beginning, the entrance of Christopher Ellison’s Morian comes almost completely out of nowhere, save for a one-scene setup of a strange beast wandering the outer ring road around the Naxy stadium. All of a sudden, brutal alien beasts are tearing fans and players (as well as the announcer) apart and Morian is gloating about how everything that’s happened was just part of his big plan to capture the Doctor’s TARDIS and use it to bet on sports events armed with future knowledge of the outcomes. On one hand, the simplicity of Morian’s plan is refreshing; no unmaking the universe, no revenge on the Doctor, no finding out why God exists in the center of the universe, just using a time machine to get stinking rich. On the other hand, Morian’s entrance simply screams “LOOK AT ME, I’M A GRAND VILLAIN, AREN’T I JUST SWELL?” There’s no foreshadowing, no build up, no sense of making him a minor menace. He just shows up like he owns the place. For all his flaws, at least Nimrod from the Forge audios had a proper buildup. Handy wroter Morian as if he was returning after being previously defeated by the Doctor and ends up getting away so the Doctor would come across him again…which, as of 2015, hasn’t yet happened in Big Finish. The other subplot was much more interesting and one I would have loved to have spent more time to watch it develop. Lord Darzil Carlisle is played by none other than William Russell, aka Ian Chesterson, aka one of the very first companions to set foot inside the TARDIS all the way back in An Unearthly Child. Russell has had a long and storied acting career, from Blackadder to Coronation Street, as well as working with Big Finish on several Companion Chronicles. He even played the First Doctor in 2013’s superb The Light at the End. Russell was supposed to appear on television opposite the Fifth Doctor in The Marwyn Undead, but scheduling conflicts got in the way. In what is The Game’s high point, Russell plays a character who is praised to the rafters, but has a deep secret. All the diplomatic work he’s done, all the peace he’s brought, all the treaties he’s forged…they’ve all been a lie. Even though this is the first time the Doctor has met Lord Carlisle, Carlisle has known the Doctor for years. In fact, all the work he’s been lauded for has actually been done by the Doctor, who’s encouraged Calisle to take all the credit so he could remain behind the scenes. Meeting the Doctor for the last time while the Doctor meets him for the first time is very much in the vein of River Song, and Russell sells the sense of befuddlement at not knowing how to run a peace negotiation mixed with the sheer joy of knowing the Doctor is about to save the day. Hearing the 88-year old Russell act opposite Davison’s Doctor is simply wonderful. As much as I’m glad Dorian hasn’t returned, I wish Big Finish would bring back Carlisle for a serial or two. I truly believe Sarah Sutton came back to the role of Nyssa to expand on the paper-thin characterization she had on television. We get a bit of that here in The Game as Nyssa attempts to help out Lord Carlisle, in the process realizing that, someday, she will indeed leave the TARDIS to establish a life of her own. Nyssa gets in a few choice lines, establishing a nice report with Hollis, and gets a chance to play detective as she realizes someone is trying to sabotage the peace talks. However, there are times where Nyssa holds the proverbial “idiot ball.” She has information for the Doctor, but he tell her to be quiet, and so she leaves it as that instead of explaining what’s going on and why the Doctor needs to know it. While doing so does push the plot forward, it does so in the laziest way possible. The Game was apparently originally intended for the Sixth Doctor, when it’s the perfect story for the Fifth Doctor and his pacifistic tendencies. Peter Davison’s performance is easily the highlight of The Game as the young and athletic sportsman Doctor immerses himself with a Naxy team immediately upon arrival, only to be sickened when he finds out just how lethal the game truly is. Even his refusal to play and hurt another backfires, when his attempts to lead his team to safety inadvertently draws the other team into a position to be flanked, leading to many deaths due to the Doctor attempts to help. Five’s indignation and righteous fury at the sickening hypocrisy of Naxy is on display as he questions his trainer about the traditions and regulations of the game and just how backward they are. His time opposite Carlisle trying to justify and gently criticize his “negotiation style” before realizing the truth about him is heartbreaking as Davison shows the Doctor’s disappointment, not with Carlisle, but with himself. “One should never meet their heroes,” says the Time Lord who met Rassilon, Omega, and now Lord Carlisle. While the sound work puts the listener into the heart of Naxy, in the pubs, in the stands, on the pitch, and in the commentator’s booth, the script fails to live to the post-production work. This just might be the most “tell don’t show” script performed by Big Finish so far. An attempt at sowing breadcrumbs about the mysterious off-world signal, done in the first episode, is the most subtle notion in the script. This is a story where things happen because they NEED to happen. Nyssa having important information and the Doctor telling her to be quiet so Nyssa can go off on her own to get attacked by a wild creature, only to be rescued because Hollis just happened to be nearby? Morian arriving without any buildup? Hollis, after itching to kill the Doctor, suddenly throwing away a chance to do so and proclaiming Naxy is wrong? Hollis’ never mentioned wife and kids dying off-screen? An entire planet, after not even a day of being under attack, uniting in peace and harmony? Destry suddenly having a large gambling debt that was never mentioned before until he brings it up to Morian? How about the rules of Naxy apparently being “run at each other and stab the other guy with a stick” because the script calls for a violent game where people run at each other and stab the other guy with a stick? There’s just so much in The Game that happens for the sake of happening, with very little build, rhyme, or reason. Does Henry want to write a piece talking about the increasing brutalization of sports? Does he want to write a political thriller about negotiations overcoming generations of war? Does he want to write a story about organized crime corrupting organized competition? Apparently, he wants to write all three, and even with six episodes, The Game simply falls apart by the end. Sylvester McCoy is the Doctor in…Dreamtime. This entry was posted in Big Finish Review and tagged Big Finish, Doctor Who, Doctor Who Audio, Doctor Who Review, Fifth Doctor, Nyssa, Peter Davison, Sarah Sutton, TARDIS, William Russell. Bookmark the permalink. I FORGOT HOW TO SMART!